A spinal tumor is a growth developing within or near the spinal cord. It can be either cancerous (malignant) or noncancerous (nonmalignant). A spinal tumor often impacts nerves along the spine which, if left untreated, can lead to pain, neurological problems and sometimes paralysis. 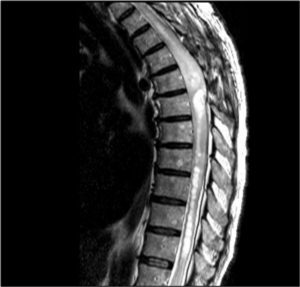 No matter whether they are malignant or nonmalignant, spinal tumors can be life-threatening and cause permanent disability. Malignant tumors spread more quickly than nonmalignant ones. Regardless, it is important to seek treatment from a board-certified spine surgeon who is experienced in removing spine tumors, such as Dr. Kern Singh, as soon as possible. There are various types of spinal tumors, depending on their location in the spine. Extradural (vertebral) tumors. These are tumors that begin in the bones of the spine. Most of these tumors are cancerous tumors that have metastasized, or spread to the spine from another area in the body, such as the prostate, kidney, breast or lung. Some of these types of tumors include osteosarcomas (osteogenic sarcomas) and Ewing’s sarcoma, an aggressive tumor usually found in young adults. Another cancerous disease, called multiple myeloma, affects the bone marrow. There are noncancerous extradural tumors too, including osteoid osteomas, osteoblastomas and hemangiomas that can develop in the bones of the spine. Intradural-extramedullary tumors. These are tumors that develop in the spinal cord’s arachnoid membrane (meningiomas) and in the nerve roots that extend out from the spinal cord, such as schwannomas and neurofibromas. These tumors may be cancerous or noncancerous. What is the Treatment for Spinal Trauma/Fracture? Surgery is the treatment of choice depending on the location of the tumor. When the tumor can’t be removed completely, surgery may be combined with chemotherapy or radiation therapy. Radiation is used following an operation to eliminate the remnants of tumors that can’t be completely removed. It also is used for inoperable tumors. Stereotactic radiosurgery is often used on tumors because it can deliver a high dose of radiation to a targeted area. Chemotherapy is often administered for spine tumors. Chemotherapy uses medications to destroy cancer cells or stop them from growing. Depending on the condition, a physician may recommend a combination of radiation and chemotherapy treatment. Patients with spinal tumors should see a board-certified spine surgeon such as Dr. Kern Singh at Midwest Orthopaedics at Rush. Dr. Singh’s immediate goals for each patient are to eliminate pain caused by the spinal tumor, restore or preserve neurologic function, and stabilize the spine. The spinal tumor may be approached surgically from the front (anterior) or back (posterior) of the body. Surgery may include tumor resection (partial removal) or excision (complete removal). When the tumor is removed (partially or completely), pain and neurologic problems may clear up. Spinal instrumentation and fusion are procedures used to reconstruct and stabilize the spine. These procedures help “fuse” and secure the area around where a disk has been damaged or removed. Minimally invasive spine surgery allows for the same tumor resection as an open procedure with the added benefits of decreased blood loss, less pain, faster recovery, and shorter hospitalizations. The number of days the patient spends in the hospital after surgery is partially dependent on the procedure performed. Thereafter, the patient’s care is monitored by periodic office visits and re-evaluation by the Dr. Singh.